The Poptart Manifesto by Rick Gualtieri: Guest Post by M. Pax: Four Earths to Support the Human Population? Guest Post by M. Pax: Four Earths to Support the Human Population? Sometimes coincidences are almost so odd as to be a little spooky. On just about everything I do online, I list myself as a writer and gadget geek. Well sometimes I forget about the geek part a bit...at least here (don't think for a second I'm not walking through life rotting my brain with some gizmo or other). Anyway, I've been feeling bad about that lately and have been racking my brain to try to come up with something to level the playing field again, lest my geek cred be called into question. Enter M. Pax. She's a fabulous writer who I know through both twitter and Triberr. Sci-fi is her genre of choice. Tell me that's not a match made in heaven. Even better, she was kind enough to accept my invitation to come and guest post on the Poptart Manifesto. In October2011, humanity reached a population of 7 billion souls. Just a mere twelveyears after hitting 6 billion. It took us 72,000 years to reach the firstbillion. To maintainthe comfort of living just a tiny fraction of us enjoy, we need four moreEarths. A changing climate puts even more stress on populations and theplanet’s resources. Our sun is about half way through it’s life cycle. When itgoes, so do we. Therefore, ifwe plan to adapt and survive, we must discover out how to leave this planet andfind other worlds to settle and live upon. We have yetto figure out how to get past the Moon. Sure, we have the technology — ships,equipment, and so forth — to get to Mars, but we haven’t figured out how tosurvive in space yet. We need gravity otherwise our bones and other systemsdeteriorate. We become weaker. Recently, it was discovered our eyesightsuffers, too. Plus, ourships aren’t fast enough to reach a planetary system outside of our own in areasonable length of time. So, ourfirst forays in colonization will probably not be with live people. They’ll becomputer controlled ships with the materials to grow new people on the otherend. People engineered to live on the worlds their ship lands on. People who’venever set foot on Earth. That was myvision when creating the world setting of the Backworlds series. The Backworlds, and it’s sequel, Stopover at the Backworlds’ Edge, tellstories about humans settling these other worlds. The Backworlds Afterthe war with Earth, bioengineered humans scatter across the Backworlds.Competition is fierce and pickings are scant. Scant enough that Craze’s fatherdecides to hoard his fortune by destroying his son. Cut off from family andfriends, with little money, and even less knowledge of the worlds beyond hisown, Craze heads into an uncertain future. Boarding the transport to Elstwhere,he vows to make his father regret this day. Free onSmashwords & Feedbooks. Will be free on Amazon in a few weeks. Sign up forM. 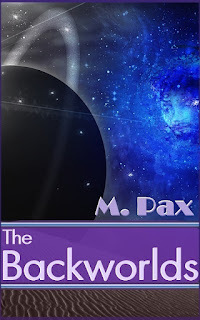 Pax’s newsletter to benotified the moment The Backworlds goes FREE on Amazon, and when it becomesavailable from other retailers. M. Pax’sinspiration comes from the wilds of Oregon, especially the high desert whereshe shares her home with two cats and a husband unit. Creative sparks also comefrom Pine Mountain Observatory where she spend her summers working as a starguide. 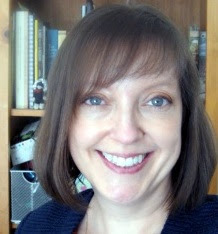 She writes mostly science fiction and fantasy, but confesses to anobsession with Jane Austen. She blogs at her website, www.mpaxauthor.com and at Wistful Nebuae. You’ll find linksthere to connect on Twitter, Goodread, FB and other sites. Great review of M Pax's book, Rick! I enjoy hearing reviews and witnessing the talent of reviewers! I find the skill of being a reviewer fascinating! I am now one of your followers, Rick! Hey, that's exactly what I do in my sci-fi novels -- I have us send unmanned small, fast ships to habitable planets and only after scanning them to ensure they truly are habitable do I have the ship kick off a cloning process and digitally seed mind data back into the clones. Voila, instant colonists! If we don't vacate, we're definitely going to need to get used to living close. Would be around to see it, infact not many generations before colonisation becomes a fact of life, But, your vision makes geek sense. Good luck with the book and sequel. Thank you for hosting my geek today, Rick. You're awesome. You all be sure to check out Rick's great books. Thanks for stopping over, Betty. It's an honor to think I followed your great mind, Ted. I'm glad I'm making geek sense. :) Thank you for popping in, Rek. That's a really nice author photo that you have there. Space exploration is very daunting. The distances are just too vast. The pleasure is all mine, Mary! Thanks for the awesome post. And thanks to the rest of you for the insightful comments. A very nice review, and nice to see a photo of MPax. Her pleasant smile comes through on her blog. I think you're right M., we've got to get off the earth if humans are to continue. Thanks, Rick, for featuring MPax.! It could be better, Michael. Oh well. Aww, thanks, DG. At some point we do need to leave. Growing new people - just sounds creepy. A bit like The Matrix perhaps - we're grown in pods? Just trying to get a visual on that. It was fun to think about, Elisa. The first people would have been, Alex. After that, they'd reproduce the usual way. We had better get on the ball with some space exploration, huh? The future could hold things all kinds of mind-boggling things. I can't wait to read your book. This world won't last forever. At some point I think it will become a pressing need, Brinda. Sweet review and very interesting points Mary. People engineered to live on the worlds their ship lands on." A great idea for a great book. That was my general idea for getting humanity out into the galaxy. I wonder what will finally be the tipping point toward colonization of other planets--with the tendency of society to make last-minute decisions out of desperation, I'd hate to think of the possible global disasters . . . I believe you're right about there needing to be desperation, Eagle.